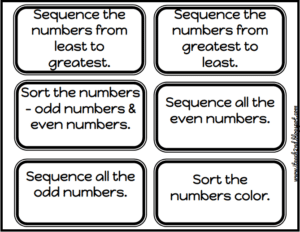 Here is a great math center you can create on a budget – Environmental Print Number Task Cards! I’m always on the watch for ways to use recycled and reused items in my classroom. Using recycled and reused items saves money and reduces the amount trash. The Environmental Print Number Task Card set uses numbers that you find on a wide variety of packages and products. It is surprising how many numbers you will find when you begin your search. Cereal boxes, snack boxes, crackers, toothpaste boxes, and so many more products have lots of numbers. Enlisting the help of others, especially parents with gathering numbers is a great way to quickly get a set of numbers. Your classroom parents want to be involved with their child’s education. If searching your throw-away items for numbers isn’t your thing, you can easily make your own number cards. Create a set of numbers on index cards for the specific needs of your students. I use the task cards with a wide variety of numbers or number cards. The center is easily differentiated when you tailor the numbers/number cards to your students’ needs or skill. To take this math center a step further, bring in grocery store ads. Students can cut out numbers and complete the suggested tasks. Students can glue the numbers they find in grocery store ads into their math notebooks. Along side of the numbers students will write their answers to each task card. The task cards are in black and white and look great printed on bright cardstock. I laminate task cards to make them more durable. 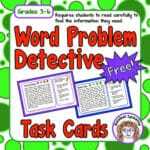 Visit my TpT store for your free copy of the Environmental Print Number Task Cards. Thanks for downloading this freebie! As always, I’m glad you stopped by for a visit! Math Riddle Cards for Your Kindergarten Kiddos! 4th and 5th Grade Math Riddles You’ll Love! Third Graders Love Math Riddles!